When I read the short story “Eisenheim the Illusionist” by Steven Millhauser, I was instantly enchanted by the attention to detail, the twists and turns, and, of course, the magic. 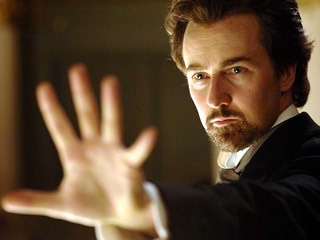 (It is, by the way, completely different from the movie The Illusionist, but that’s another post.) The way Millhauser writes about late 19th century Vienna, you would think he had lived there. Or, at the very least, that he had read about five hundred very large books about that period in time. That’s what’s so absolutely mesmerizing about the story. When you finish it, you wonder how he pulled it off. Did he really read five hundred books? Is Steven Millhauser secretly a time-traveler? Or is he just a really excellent illusionist himself, skilled at creating verbal sleight of hand that helps his readers believe him? And, of course, the follow-up question to the latter: how can I steal all his tricks and become a Pulitzer Prize-winning writer, too? Now, it is well known among magicians and mediums that a canvas of unbleached muslin may be painted with chemical solutions that appear invisible when dry; if sulphate of iron is used for blue, nitrate of bismuth for yellow, and copper sulphate for brown, the picture will appear sprayed with a weak solution of prussiate of potash. By focusing on small details, Millhauser suggests an entire world to the reader, and the reader leans in along with the narrator. There is no need to go into political particulars, the exact buildings, or the precise geographic layout. We are satisfied. When you’re looking at something up close, it doesn’t occur to you to look again at the same thing from a great distance. It is human nature to zoom in. This idea reminded me of this watercoloring video I watched. At the time, I was trying to sharpen my art skills by following instructional videos. One of the narrators gave this important piece of advice: “Beginners think they have to paint every darn brick in a brick wall. You don’t paint all the bricks! You just have to paint a few and that suggests the rest are there.” I’m working on applying this idea to my own writing.